This morning, my girlfriend calls and tells me that the kitten we adopted together almost a year ago caught her first bird which she brought into the house. She made the kitten drop the finch and hoped that it would be OK, but Moon Fox had effectively ended its’ life. I suggested that she give the bird a dignified burial in one of the soft dirt mounds by our desert house. About 5 pm this afternoon, I see a young bird fly right into a window outside the door of the Dionysus office here in Burbank. 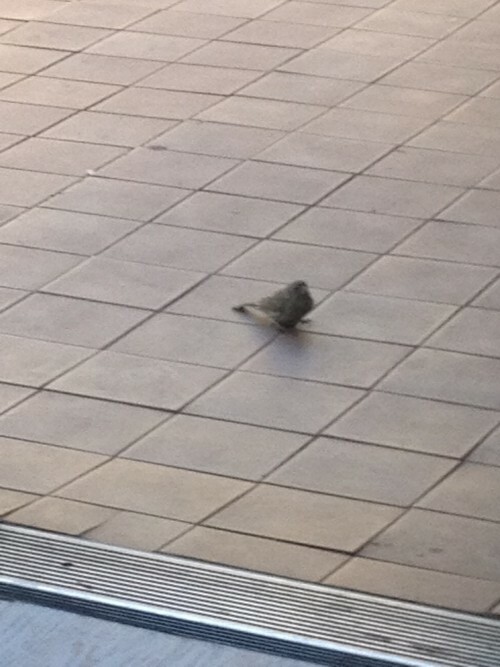 The poor thing fell and hit the ground upside down, freaking out, attempting to flap its’ wings to no avail. I gently turned the bird over with my shoe and watched as it laid there in shock, breathing rapidly, eyes opening and closing with its’ head down, beak on the ground. I called my girlfriend, told her the story and asked if there was anything she suggest I do. She told me to leave it be. I felt genuine sorrow for this bird. My girlfriend and I were both feeling a bit sensitive today. I sat back at my desk, able to see the bird outside the door, lying there, taking my eyes away from the computer screen every few mometns to see how it was doing, hoping it would come out of shock and fly away. About 15 minutes after the bird’s crash landing, I decided to go into the warehouse and look for a box for another potential bird funeral but came back out to find the bird up and on its feet, just standing there, alive but still. I snapped a photo with my iPhone then went to the door to get a better look. Out of nowhere appeared a praying mantis, walking right towards the bird. I did not know what might transpire between the two so I closed in and inadvertently startled the bird who took off and flew away. I felt a wave of relief and happiness for my winged friend’s recovery! Usually the Praying Mantis makes an appearance when we’ve flooded our lives with so much business, activity, or chaos that we can no longer hear the still small voice within us. Taking a step back and some simple meditation would be in order here because the external din we’ve created needs to be quieted so that we can come back to our own truth. 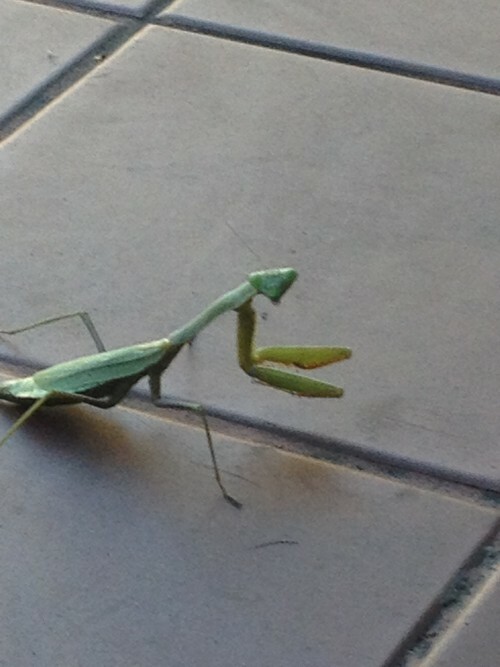 The Praying Mantis always comes to us when we need peace, quiet and calm in our lives. After reading this I went back to the door. The Mantis had vanished. OK, I have been busy, a bit flustered, somewhat chaotic and stressed, and have had little to no rest in the past couple of weeks. It’s not the greatest way to exist I guess. I stepped back, closed my eyes, did some deep breathing and thinking. Even though I went back to work, I decided to write about this episode and put the words “peace”, “quiet” and “calm” on my priority list. I’m going to keep those words on all of my priority lists in the future and will try to dedicate some time daily to these three things.